According to a press release,Verizon adds two new data-packed prepaid plans to give customers even more value, on verizonwireless.com, Verizon Wireless Prepaid is adding two new plans to their existing lineup. The new $50 plan includes unlimited talk and text with 5GB of 4G LTE data and the new $70 plan includes unlimited talk and text with 10 GB of 4G LTE data. 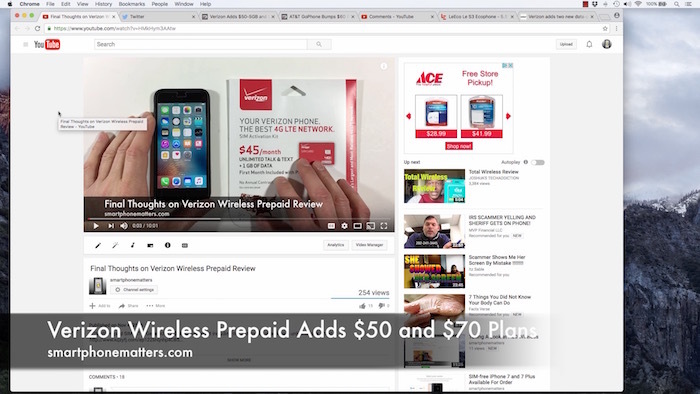 I talked about the features of Verizon’s prepaid wireless plan recentlyin my Final Thoughts on Verizon Wireless Prepaid Review article. The press release however now mentions that these new plans will include Carry Over Data, which is new. The news plans are available on November 13 so I’ll checkout verizonwireless.com then to find out the details about the carry over data then. Thanks to @ravenwoodMT on Twitter and Francisco for letting me know about the new plans. Do any of these Verizon prepaid plans support iPhone Visual Voicemail? The website says they do not, but I’d like to find out without having to spend money to “try it” and then be disappointed.